We’re happy to inform you about a really fun and cool promotion at Thrills casino right now. You will have the chance of winning a trip of a lifetime down Route 66 – together with two of your best friends! How awesome does that sound? Thrills is about thrilling experiences, that’s for sure if you ask us! It’s really easy to participate in the competition. Just log in at Thrills and play casino games until the 9th of July. The casino will have a new draw every week where you can win cash prizes or free spins free from wagering requirements. Players who wins in a weekly draw will also get golden tickets to the super draw where the trip will be given to one lucky person on the 10th of July. 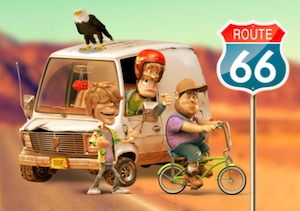 The main prize is the trip along Route 66 with your two friends and this includes flight tickets, a rental car for 13 days, £4000 in spending money as well as nights in several cities such as Chicago, Oklahoma City, Las Vegas, Grand Canyon and Los Angeles! For all you free spins lovers out there Thrills offers a promotion to celebrate the launch of Sweet 27 with a prize pool of 5000 bonus spins. If you want to enter this draw you will have to log in and play Sweet 27 between the 29th of June and the 2nd of July. For every £10 you wager on the slot you will receive a ticket. And if you play for £10 on your tablet or mobile you will get two tickets instead. Thrills will draw none the less but 775 winners who will get free spins from the prize pool and these will be paid out on the 3rd of July. As always your winnings from bonus spins at Thrills are free from wagering requirement making it easy for you to make a withdrawal whenever you want to. As you might already know there’s a new video slot from Yggdrasil available at Thrills casino. We’re talking about Sunny Shores! To celebrate this you will be able to join another promotion at Thrills between the 29th of June and the 6th of July. There’s a £35 000 prize pool! Just log in and play Sunny Shores until you’ve collected at least 100 Sunny Wilds within the promo period. One lucky player will win £5000!